When I got my Instant Pot, I was able to get rid of my rice cooker to save some appliance space. However, I didn’t factor in that if I was making my main dish with the Instant Pot…I suddenly had nowhere to cook my rice as a side dish. Oops. I’ve never been a stove-top rice kinda gal; my water ratio was always off and it seemed to take forever and I constantly messed it up. So, the obvious solution to my new predicament was to bake my rice. I absolutely loved The Kitchen Magpie’s buttery mushroom rice recipe, which is baked, so I fiddled around and came up with a great recipe for easy baked rice which you can double for larger crowds. You can very easily add spices and other flavours to mix it up! Spray a 9×9″ casserole dish with non-stick spray and preheat the oven to 425ºF. I always soak my white rice, or at least rinse it off first. 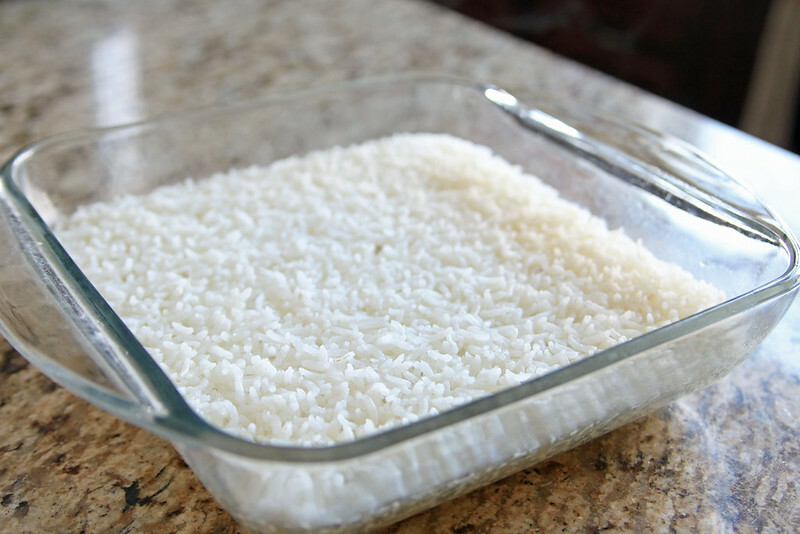 Place the rice in the dish in an even layer and have heavy duty tinfoil ready to go, unless your casserole dish has a lid. 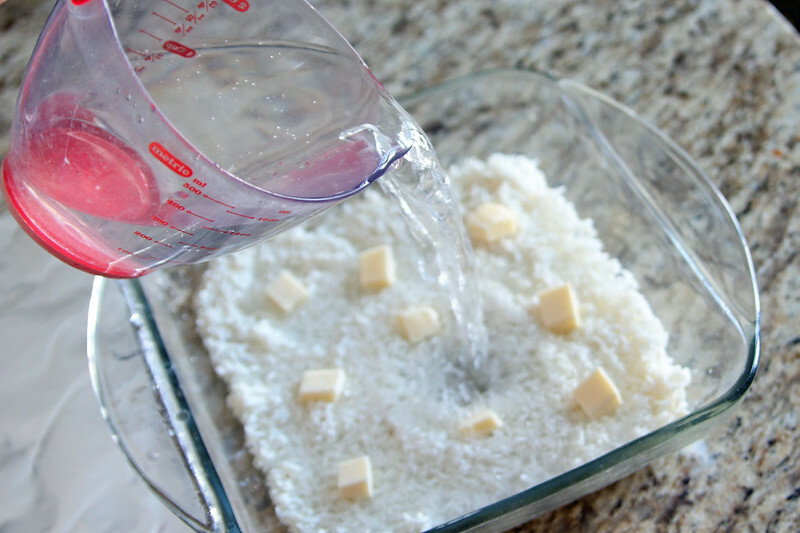 Put cubes of butter evenly over rice, season with salt – I use a bit more salt if I use plain water, less salt if I use chicken stock. Speaking of which, boil water or heat up chicken or vegetable stock to boiling (or whatever liquid you prefer to cook rice in) and pour over rice and immediately cover with tinfoil, sealing edges tightly. Bake for 20-25 minutes, depending on your oven, check rice and fluff with fork. Every time I have made this, 20 minutes isn’t enough in my oven. I find that if I turn my oven off after the 20 minute mark, put the tinfoil back on and just leave it, it finishes cooking for me within 10 minutes. I make this about once a week and now I just cook to 25 minutes and it’s perfect every time. This also stays warm really well if you turn the oven off and keep the tinfoil or lid on to prevent it from drying out. You'll wonder why you haven't done this all along! 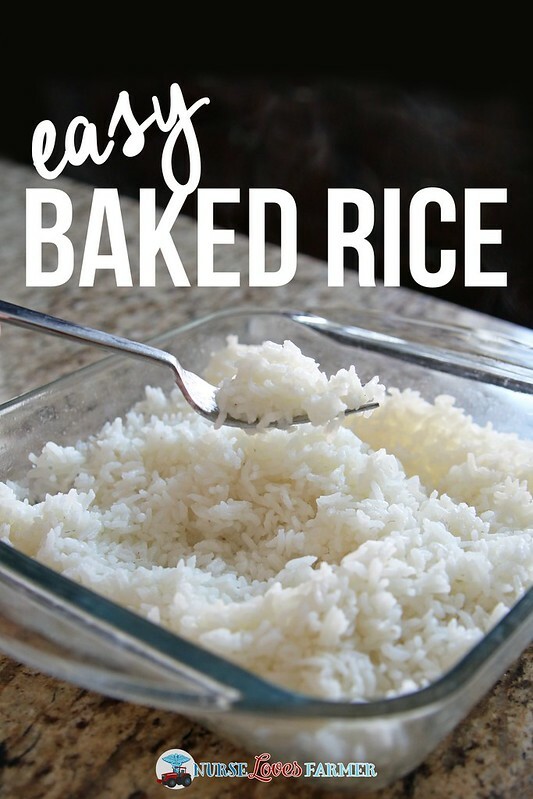 Easy, perfectly baked rice every time! Spray a 9x9" (or similar) size casserole dish with nonstick cooking spray and preheat the oven to 425F. 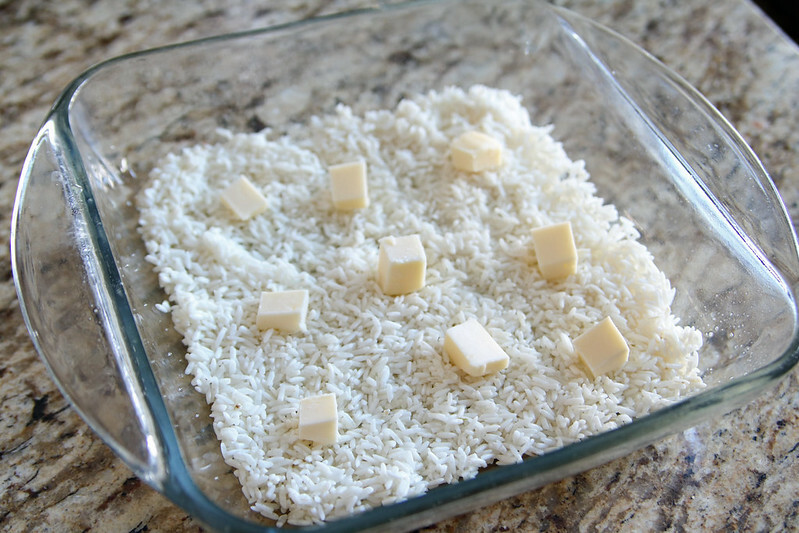 Place uncooked white rice in an even layer in the dish and dot with cubes of butter on top and season with salt. Have heavy duty tinfoil ready to cover dish (or use lid of casserole dish if applicable) and pour 2 cups of boiling water or soup stock on top of rice. Cover immediately and seal tight. Bake in oven for 20 minutes, fluff rice with a fork and check if it's done. Return to oven and check in 5 minute increments until done. I like to add 2 tsp of Oxo chicken bouillon to my boiling water for a nice chicken stock; I don't add as much salt if I do this. 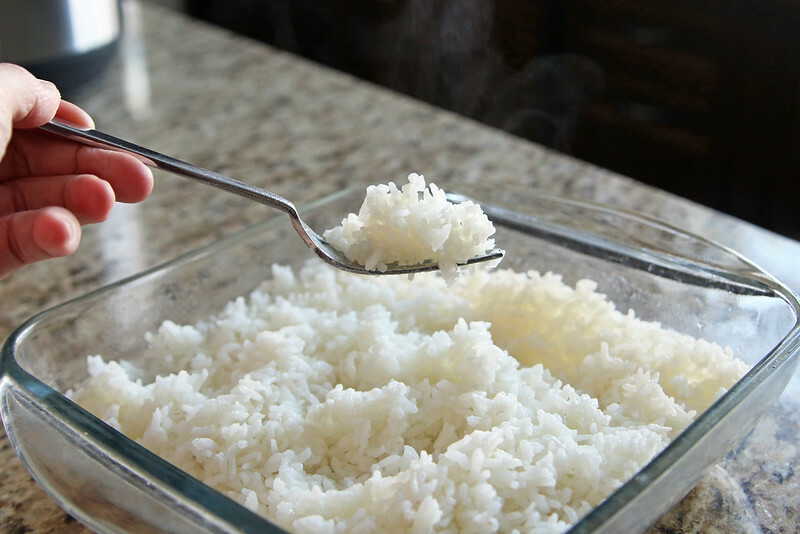 If your rice isn't quite cooked at 20 minutes, fluff with fork, cover and return to oven. Turn off oven and it will finish cooking while your other dishes are cooking. If you like to cook brown rice, which I never do, from what I have read it will take longer to bake, about 40-45 minutes and you might want to add more water if you are using Basmati rice. 1 cup of rice is about perfect for my I-guess-we’ll-eat-rice-because-mom-is-sick-of-making-potatoes family and to have some leftovers. Very easy to double or even triple for a large crowd. All you Instant Pot users, I know you can buy a stand and dish to cook rice in your Instant Pot at the same time as your meat…but I haven’t tried it and don’t care to spend more money on accessories. Speaking of money, this post has affiliate links in it; thanks for the support!